During President Obama’s speech to the nation last week, he mentioned that the White House would be working with the federal housing agencies to help more homeowners refinance their mortgages at today’s low rates. Currently, in order to be eligible for a HARP refinance, a borrower must have a mortgage owned or guaranteed by Fannie Mae or Freddie Mac, be current on mortgage payments, and have a first mortgage that does not exceed 125 percent loan-to-value. That last bit seems to be the issue at hand, as there are scores of borrowers who meet the first two guidelines, but not the third. To give you an idea, 85 percent of the Miami and Orlando MSAs were underwater as of last year, with average LTV’s of 150% and 140%, respectively. In Riverside, California, the average LTV was around 164 percent last year, and has probably worsened since then. So pretty much all of the hardest-hit borrowers haven’t been eligible for HARP. Under the new refinancing plan, the LTV ceiling would be lifted or possibly removed, allowing these types of borrowers to refinance to take advantage of the record low mortgage rates currently available. But it’s very likely that you would still need to be current on mortgage payments to qualify. And while the new proposal sounds decent in theory, many of these borrowers have been grappling with a lack of home equity for years now. So if they were going to walk away, they probably would have by now. Or they would have at least missed a payment or two. If payments are lowered for the select few who have stuck it through, but are deeply underwater, they’re still left holding onto a house worth much less than the mortgage. How much better off will someone be paying $200 less per month on a $300,000 mortgage worth just $150,000? Even if it does make a big difference, the program still banks on mortgage rates remaining low and home prices reversing course in a major way, as it doesn’t address principal forgiveness. Then there are the homeowners with mortgages not backed by Fannie and Freddie, which while far fewer in number, account for a huge chunk of the problem loans. A few years back, former FHFA director James B. Lockhart noted that these private-label securities accounted for 62 percent of all seriously delinquent mortgages, and thus, were the root of the problem. These have yet to be addressed on a large scale, and probably won’t be, aside from on a case-by-case basis. And so there may be some economic stimulus associated with this program (more money in some pockets), but it certainly won’t be a silver bullet. Perhaps only time will sort things out, as impatient as we are. 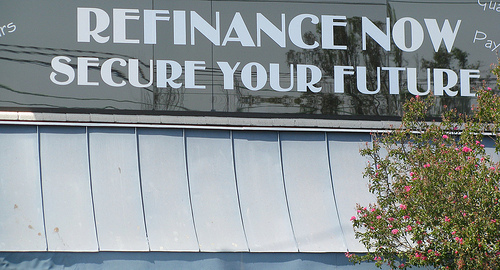 Read more: Can I refinance with negative equity?